Ever since I was a little girl, my dad would remind us that the amount of effort that someone puts into something reveals their true character. Very true. He also would never encourage nor allow us (really) to quit something that we had committed to. Be it a team sport, chores, personal projects. It’s funny, I never perceived my dad as being strict or unreasonable, just involved and loving. At a young age, I knew he was teaching us life lessons, albeit I didn’t know that at the time. If I left a sip or two of milk in the glass at the end of dinner, look out. You finished the milk because we were taught not to be wasteful. Or standing in front of the fridge with the door wide open as I was deciding what I wanted. Nope! “Shut the door Donna, electricity.” Then we move on to the biggies. Getting in trouble at school, my dad would calmly call or come to the school to learn the facts. With a few of the incidents, I was in the right and my dad went to bat for me. He supported his daughter. Or the time, as a high school student I quit Varsity cheerleading. I think my feelings were hurt or something dumb. I showed up at home and told my parents what had happened. Promptly, my dad and I were in the car driving back to the high school, walking thru the gym past the entire basketball team as we approached 3 squads of cheerleaders plus my coach. My dad stood behind me (offering his backbone) as I apologized and explained to the girls and coach that I regret quitting and could I please continue? Yes I could. My dad quietly left the gym and I didn’t quit. It was the best Senior year ever! The title of this page is, PERSEVERANCE. One may wonder why I referenced my dad and the consequential life lessons learned? This bear was purchased for me as a birthday gift from my parents many years ago. 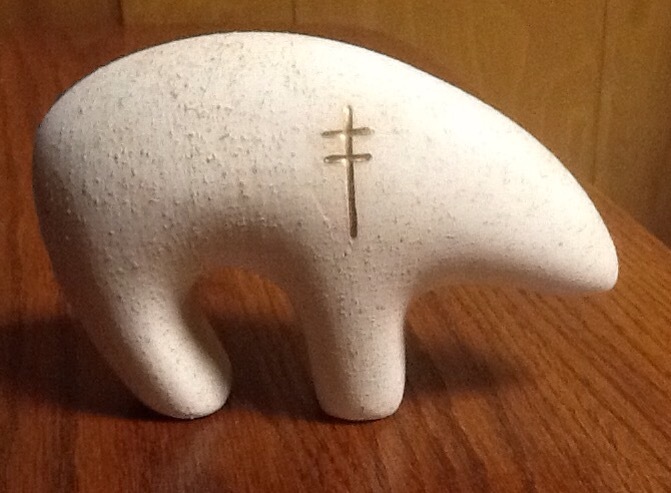 This bear’s symbol represents PERSEVERANCE. They told me that tenacity and perseverance were 2 good qualities that I had and they hoped when I looked at the bear it would be a reminder that I am tenacious and have perseverance. I now cherish this power bear. Those synonyms are exactly what I have used to get past obstacles that show up and the challenges to goals that I have set. No matter the outcome(s), good or bad, if I care about something or someone – I’ve been known to act like a tenacious pit bull. Sometimes this asset can become a fault. There have been many times when the opposite of perseverance, tenacity, determination, and staying power have caused me harm. I think the opposite to these are laziness, apathy, and idleness. More about this later. Seeing that my blog is focused on chronic pain of all sorts, for me it’s my spine, I will share with you, everyday I pray to the Lord to help me remain steadfast in recognizing and having the courage to follow his will for me. I cannot tell you how many times during the many discussions of all 7 (seven) surgeries, I prayed, should I remain persistent in be willing to try anything and everything I can to get better? Painful procedures were not the determining factor. Stated risks and side effects was not of any concern. Having remaining pain was a given because they told me up front I would not be pain free after surgery. 1. When will my 2 kids be back at college so they don’t have to deal with the ugliness of seeing their mom in a hospital. I never wanted to burden them; although they saw enough to know. The last thing I wanted to do was worry them. 2. My mom offers to come take care of me and of course I want her here with me. I miss her and I love spending time together. When I have surgery, it’s almost undivided attention. 3. My husband takes work off indefinitely to help me. He’s at home early and is so kind. 4. My family and friends rally behind me, say prayers, and visit. 5. Is my pain that bad in both my back or neck? 6. What if they slip and I’m permanently altered or paralyzed? No, won’t happen to me. 8. I have a good dr. He is respected and qualified so I’m in good hands. I never did my OWN diligent research. For the most part, I went on other peoples recommendations and trusted them. They know more than me. I noticed a pattern. When it came to the less important factors,(spilled milk) I placed more priority on other people and their needs. It honestly didn’t occur to me that I placed my health, risk, and outcome at the bottom of the list. I promise you, I relied on my ability to persevere and remain diligent on smiling and handling these surgeries with determinatio. I had to convince everyone around me that this was the right thing to do and I’ll be fine. I can do this. I did it alright. When it was all done, hospital bed returned, parents back in FL, 3 mths into recovery I began to discover the change in my life style and I had to persevere or rather, endure loneliness, pain, and now what? I trusted family, friends, dr’s, etc. everyone but me. I recently realized that mentally and psychologically I didn’t go into the surgeries with a positive attitude. I didn’t care or believe that it would work. I was convinced that I had no choice. In fact, 3 or 4 of the surgeries I never should have done. I recently discovered that the last one I had was done 100% incorrectly for my particular condition which has caused me to face 4 additional revisionsurgeries. So, as I lay in this bed with my surgery date 3 weeks away, I ask myself the same questions but my priorities have switched. 2. Make a realistic pro/con list. 3. I attended a class that the dr’s office offered explaining the procedure and what to expect. 4. What are my pain med options? 5. Researched my dr. every way possible. I’m 100% confident in his plan and ability. 6. The surgeon, upon my request, went vertebrae by vertebrae. Showing me on the MRI the fractured vertebrae, broken hardware and why it happened and how to fix it properly.I’ve always been afraid to bother dr’s with dumb questions. I don’t want to be “that” patient, I want them to like me. Can some of you relate? I’am quite certain many of you can not relate to that statement and that’s ok. I’ve changed. It’s ok to ask questions and take my time. It’s my life! 7. Is work covered? Is my husband clear to miss work? Are both of my kids in a good place personally? The best part…I told my mom to stay in FL for surgery and to come with my dad once I’m home from hospital. I don’t want my mom to sit in a waiting room for 8-10 hrs. and then see me the 1st few days. 8. I’m going to pack my husband a waiting room survival kit in advance. ( snacks, drinks, reading material, pillow, phone charger, thermos of our good coffee, etc.). It’s going to be a very long day and that is the right thing to do to show my love and gratitude. The theme of this post is perseverance. I have my moments of doubt and fear but I’m practicing positive self-talk. I continue to pray and meditate everyday. My sister suggested that I begin to read the bible with the simple request of wanting to hear God’s voice for me. He loves me and protects me. I will continue to embrace my asset to persevere, stay the course and believe that this surgery will work. I’ll do my part and I welcome any words of encouragement or experiences. For this particular post, please try to share hope, faith, success. There are many more topics to be real. This one demands perseverance for positivity. Embrace the spine you have Powered by WordPress.com.